How Can We Curb ‘Death by Overwork’? So begins a 1951 employee handbook at Dentsu, Japan’s largest ad agency, written by its then-president Hideo Yoshida. Nor is Tegahashi the only recent victim of karoshi. Over the past decade in Japan, more than 300 people each year have been awarded compensation from work-related accident insurance after suffering either heart attacks or strokes. (If the cause of death is judged to be karoshi, the victim’s family receives compensation from the government of around $20,000 per year and company payouts of up to $1.6 million.) And a 2016 government white paper claimed that one in five workers was at risk of death from karoshi. The problem, explains Scott North, a professor of sociology at Osaka University, is that Japanese workers are incentivized to work around the clock to get better evaluations, and bosses don’t tell them to go home because the extra effort makes them look good. Americans used to work like this, too. In 1890, the average work week for a full-time manufacturing worker was more than 100 hours. But thanks to tireless efforts by labor organizations like the National Labor Union, the United Auto Workers and the Knights of Labor, Congress passed the Fair Labor Standards Act in 1938. As a key component of Roosevelt’s New Deal, the FLSA limited work weeks to 40 hours (they flirted with a 30-hour work week) and introduced the concept of overtime, guaranteeing time-and-a-half pay for all hours worked beyond 40 per week. “Eight hours for work, 8 hours for rest, 8 hours for what we will,” became a common labor slogan. North is referring to “T-FREND,” a first-of-its-kind drone currently in development by the Japanese security firm Taisei. Come October, T-FREND will hover over after-hours workers blasting “Auld Lang Syne,” commonly played when stores are closing in Japan, to force them to leave. 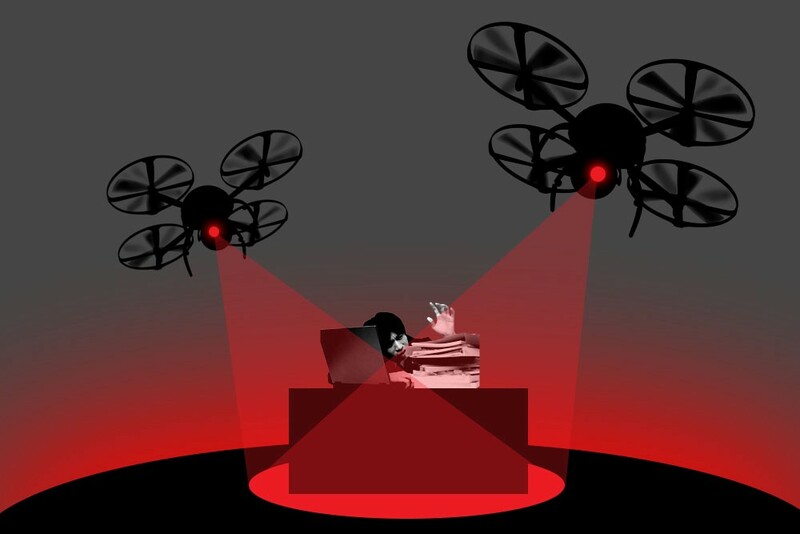 However: “I don’t think a drone blaring music in offices late at night would work in the U.S.,” says Swish Goswami, a 20-year-old venture capitalist and TEDx speaker who points to the obvious civil liberties implications of camera drones hovering over employees after hours. But also, he says, most U.S. companies cap overtime hours, so the drone’s usefulness here would be limited. According to the Bureau of Labor Statistics, the average American works 44 hours per week, or 8.8 hours per day. In some industries, though, like tech and finance, employees routinely work an excess of 60 hours a week and must be available constantly via their smartphones. “Effective enforcement is basically impossible without extreme micromanagement of people,” Waber says. “Which is something most businesses try to avoid.” To see if policies are being circumvented, for example, Waber says a manager would need to read all of an employee’s emails to determine if after-hours work is covertly being assigned or teams are meeting across the street at Starbucks after the office lights go out. Elsewhere in the world, the government is attempting to do this micromanaging via legislation. For example, a new labor law took effect in France last year that gives employees the “right to disconnect” from email, smartphones and other electronic leashes once their working day has ended. It’s designed to “ensure respect for rest periods and balance between work and family and personal life,” the Ministry of Labor said in a statement. That’s all well and good, says Thomas Chardin, director of a human-resources consultancy in Paris, but today’s digital tools are blurring the line between personal and professional life. Email and Slack mean you never really leave the office, he explains, which makes office drones like T-FEND a bit silly. In fact, a 2013 study by the American Psychological Association, for example, found that more than half of those surveyed checked work messages at home. Furthermore, tech companies are determined to create “homelike” environments at work. John Schoettler, head of real estate at Amazon, says he aims to make communal areas into “living-room-like spaces” with “TVs, couches and bookshelves” including framed photos of employees. So who wants to leave the office when it provides free food, video games and a framed selfie of Kevin from accounting? The problem with overhead drones, email suppression and even legislation, he says, is such strategies don’t address underlying problems, they only paper over them with technology. If you’re simply chased out of the office with a shitload of work to do, that’s just avoiding the problem and adding to your anxiety, he notes. Instead, a cultural shift is required. As a result, he says, Gen Z won’t be the ones responding to worker burnout.